92643015368 Hood Struts - yes/no? My new car needs hood struts. Using a broomstick gets old quick. 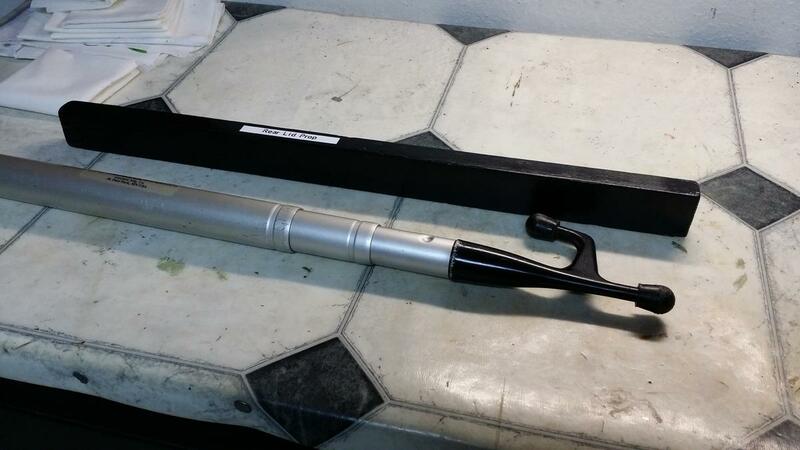 Inside the tool kit were two new unused struts with 92643015368 part numbers. Stabilus is printed on the side. Does anyone know if these are usable and proper strut for my car? I'd hate to go through the hassle of installing them only to find they are too powerful or the wrong length. I've heard that some aftermarket ones can flip pancakes. The picture shows what looks like the number 993 511 331 00 on the upper strut. If that is the number then this is a pair of 993 front struts. These cost $20 each at Pelican. They aren't that difficult to replace. You might put these in and see if they work and, if not, buy new. Or since they aren't that expensive you might just go ahead with new ones. You are right. When I put my glasses on I can see the 993 part number. These have the clip rather than wire pin type I've read about while searching here. The struts don't seem to have a very long service life so I made a high tech prop out of wood. It's the premium version as it is made from oak. I love those oak ones but after much research I went with a beautiful extendable aluminum boat hook. Anyone ever try these? They're for a 993, made by the same manufacturer as the ones in the photo above (Stabilus) and come with a lifetime warranty? Can't see the harm in giving these a try. Has anyone tried to use the warranty when the struts gave up? I installed them tonight and they work fine. The ones I replaced had a build date of 11/05 and were the same type and manufacturers number. Replacing hood shocks and rear deck shocks is well-worth it, glad the shocks you found in the tool kit worked fine! Getting struck on the head by the hood is never a good thing and yes, the broomstick does get old fast! I have big hands, and I've looked at replacing my worn out ones many times. I just don't see how to access the lower attach point without removing a ton of other stuff. What's the secret? I've replaced my rears, but the replacement fronts have been sitting on the shelf for awhile. It is a each with not much space. The long bladed screwdriver did it for me (that and practicing outside of the car first, as recommended in the DIY). Quick Reply: 92643015368 Hood Struts - yes/no?